As with previous vintages, this bottling of ‘The Noble One’ is a bold and juicy offering. The nose presents aromas of black fruit, spice and a hint of molasses. The flavors also reflect notes of black fruit, cola and baking spices. Hints of orange zest and milk chocolate complete the complex finish. Ready to drink now, but with proper cellaring, may age as long as 12 years. 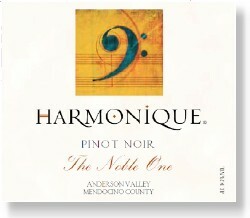 The core of this wine came from vineyards in the cooler, “deep end” of Anderson Valley. Klindt Vineyard (clones 115, 777 and Pommard) and Wiley Vineyard (clones 115 and Pommard). Although the average Brix level was 24.2, the Wiley was harvested nearly 2 weeks later due to its location closer to the ocean and exposure to cooler breezes that slowed the ripening.